The Bangladesh Forest Department has started forming dolphin conservation teams involving community people to protect the endangered aquatic species in the rivers of the Sundarbans, the world's largest mangrove forest, reports BSS. "We've already formed three dolphin conservation teams in the Sundarbans and will constitute more such groups to protect dolphins," Md Modinul Ahsan, Divisional Forest Officer and National Project Director told the news agency. Noting that the conservation teams are working voluntarily to create awareness among the community people so that they come forward to save dolphins in the Sundarbans, he said the team members have already received training to this effect. Modinul said when dolphins are caught in the nets of fishermen in the Sundarbans' rivers, the conservation teams immediately inform the forest officials about the incidents and thus dolphins are rescued and released to nature. The Sundarbans is a home to the Asia's last two remaining freshwater dolphin species - the endangered Ganges River Dolphin and Irrawaddy Dolphin. under 'the Expanding the Protected Area System to Incorporate Aquatic Systems Project'. and the Global Environment Facility (GEF), the Forest Department in collaboration with IUCN Bangladesh is implementing the project. IUCN Programme Coordinator ABM Sarwar Alam said three dolphin conservation teams have already been formed in the Sundarbans and such four teams will be floated soon to monitor and check fishing in the dolphin protected areas of the mangrove forest. The department has so far identified several hotspots in Sela-Supati rivers, Sibsa river, the estuarine area around Putney Island, Pasur River, Baleshwar Estuary, and the Pankhali confluence, covering an area of 571 square kilometres. In 2012, the government declared the Dhangmari, Chandpai and Dudhmukhi areas of Pasur and Andharmanik rivers as 'dolphin sanctuaries', covering 32 linear kilometres. Sarwar Alam said after introduction of the conservation teams, fishing declined by 70 per cent in Dhangmari sanctuary and that is why the state of dolphin is good there. A huge number of cargo vessels ply through the canal of Chandpai sanctuary every day, posing threat to dolphins, he said. Boundary of the channel has already been demarked for plying water vessels, so dolphins could be protected controlling vessel movement, he added. Dolphin are still in danger. 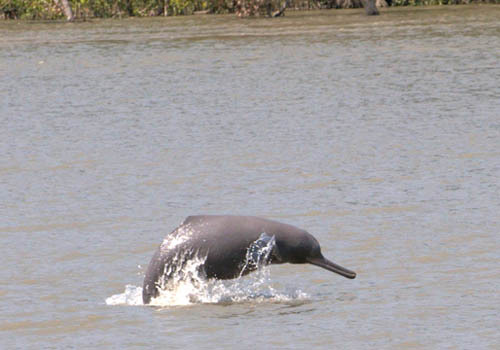 Sundarbans is the only place where the Ganges river dolphins and Irrawaddy dolphins are found together. But these are now endangered mammals due to both natural and manmade causes. The population of Ganges and Irrawaddy Dolphins in the Bangladesh portion of the Sundarbans was around 225 and 451 respectively, estimated by the Wildlife Conservation Society (WCS). Dolphins are frequently killed getting trapped in fishing nets. An official survey shows dolphins are facing threat by 70 per cent to incidental killing by fishing net while 8.0 per cent to poison fishing, 6.0 per cent to decline of fish and crustaceans, 6.0 per cent to decrease of freshwater flow and 5.0 per cent to siltation. According to an unofficial survey, at least 130 dolphins were killed in the riverine, coastal and marine waters of Bangladesh from January 2007 to April 2016 either because they were trapped in fishing nets or injured by thepropellers of ships. To build capacity and increase the awareness among the communities and other stakeholders for protecting dolphins, the Forest Department is now implementing an outreach, capacity building, and management plan, which is a component of the Expanding the Protected Area System to Incorporate Important Aquatic Ecosystems Projects project.